After upgrade to a later version of Cognos Controller 10.4, where also BI 10 have been replaced by CA11, the PDF shown inside Cognos Controller client is small. HTML reports works fine. The user profile of the user executing the report is referencing a style (also known as skin) from IBM Cognos Business Intelligence 10. In IBM® Cognos® Analytics, in the lower-left corner, click icon for administration, select Administration Console. On the Security tab, click Users, Groups, and Roles. Click the namespace that contains the user. Find the user whose preferences you want to view or change. You can use the Search feature to find a user Searching for entries using name, description, and name or description. For that user – in the Actions column, click More. Click the different tabs to view or change the settings. In the Preferences tab, choose Style Corporate. Make the change and click OK.
Test again to run a report in Cognos Controller as PDF. When doing currency conversation in a consolidation you get a error “ActiveX component can’t create object”. 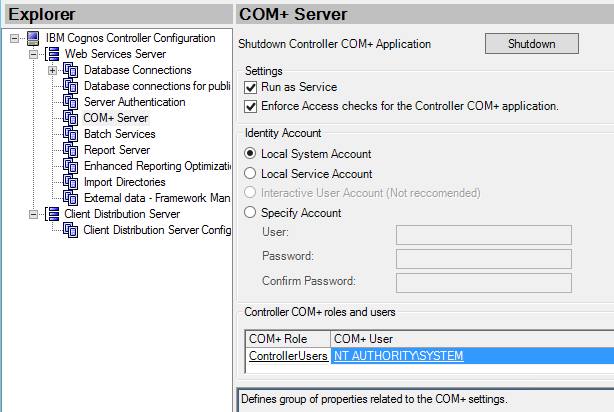 Login to the Cognos Controller Window server. Go to the application pools. Select the application pool for controller, can be NET v4.5 or Controller (depending what you have named it), and click advanced settings. Under Process Model, change Identity from ApplicationPoolIdentity to LocalSystem. Also ensure the Idle Time-out is 600 minutes, and not the default 20 minutes. Cognos Controller Users are disconnected from Server, and have to start there Cognos Controller client again and login. Change the Recycle from default 29 hours to a specific time at night, when few users are using Cognos Controller. Login to the Cognos Controller Server. Click on DefaultAppPool or the one created for Controller. Unmark the default of 1740 minutes intervals. Let the user test Cognos Controller more than a day before you define if this solve your issue. After upgrade of Cognos Controller Client on Citrix server, the help menu does not work. Error Launching menu item “Help”. Could not find a part of the path ‘c:\program files (x86)\IBM\IBM Cognos Controller\ctrl_ug_fapug_contectlinks.csv’. The file ccr.exe.config contain the wrong path. Open C:\Program Files\ibm\IBM Cognos Controller Local Client\ccr.exe.config in notepad. Save the file and try again. Check also that <add key=”HelpUrl” value=”http://www.ibm.com/support/knowledgecenter“/> point to the correct web address. # deposited with the U.S. Copyright Office. Then in the users profile, check the same values are correct, in the file /appdata/roaming/cognos/ccr/ccr.config. Connection failed. 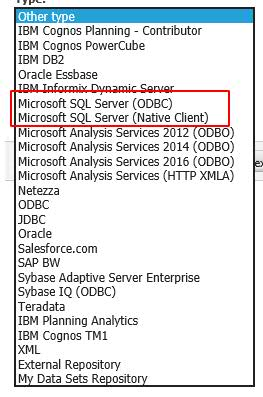 ODBC SQL Server driver. April 16, 2018 by Roger·Comments Off on Connection failed. ODBC SQL Server driver. Standard reports in Cognos Controller does not work. You have to manually change the database connection string from SQLOLEDB to Native SQL. Go to old Administration page. Go to Set Properties for the connection. Change the value and save it. The Cognos Datasource connection string that is automatic created from Cognos Controller Configuration repair button creates non-supported data connections in CA11. Above is the supported data sources in Cognos Analytics 11. When logging in to Cognos Controller 10.3.1 after a new setup some users get a error. This setup is with 3 citrix servers and 3 controller application servers, where the controller functions is scaled out over the different controller application servers. On each citrix server the ccr.exe.config file point one of the controller application servers – to allow some kind of load balance to the controller applications server layer. Error occured at 3/22/2018 8:18:10 AM in IBM Cognos Controller, Error No=5, Source=FrangoDirect.ConnectionDirect.SetSelectDb#System.Web.Services, Description=System.Web.Services.Protocols.SoapException: Server was unable to process request. —> System.Net.WebException: The request failed with HTTP status 404: Not Found. The web.config file have not a correct servername for the ccrRemoteServer value, it can be a extra special character or something that make the “http” string not work. Test the string in Internet Explorer from the slave server – can it surf to the master server? If you have CA11 on the same server as your cognos controller installation, then the caservername and masterserver is the same address. 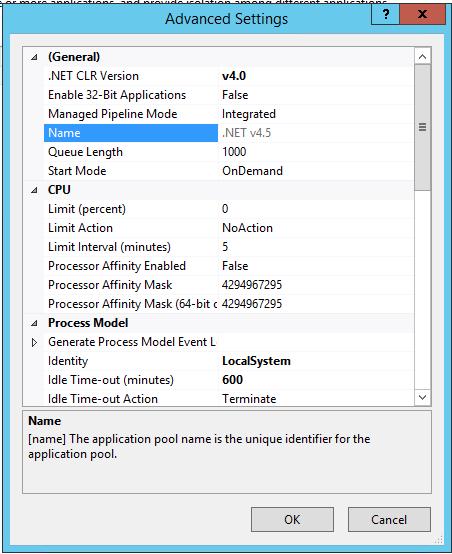 Naturally, modify the value ‘MASTERSERVER’ with the name of your ‘master’ application server. After installation of a interim fix on top of a Cognos Controller 10.3 installation, some of the Cognos Controller windows services are missing. Here instructions on how to install a upgrade, on top of Cognos Controller. After the installation check that all Cognos windows services are in place. Error when you try to login to Cognos Controller client, after you have selected the database to use, and you have been logged in as a CAM user. Login to your windows computer as a user who have rights to use Cognos Controller. Then it will work. This user is not added inside Cognos controller, and therefor can not login. An error occurred while trying to access the server when you start the Cognos Controller client and try to login. System.Web.Services.Protocols.SoapException: Server was unable to process request. —> System.ArgumentException: Requested registry access is not allowed. In the IIS manager change the user account used by the Application pool that Controllerserver is using.